Starring: Emily Baldoni, Hugo Armstrong, Maury Sterling, Nicholas Brendon, Lorene Scafaria, Elizabeth Gracen, Alex Manugian, Lauren Maher. Much has been said about Karyn Kusuma’s dark mystery The Invitation in 2015. 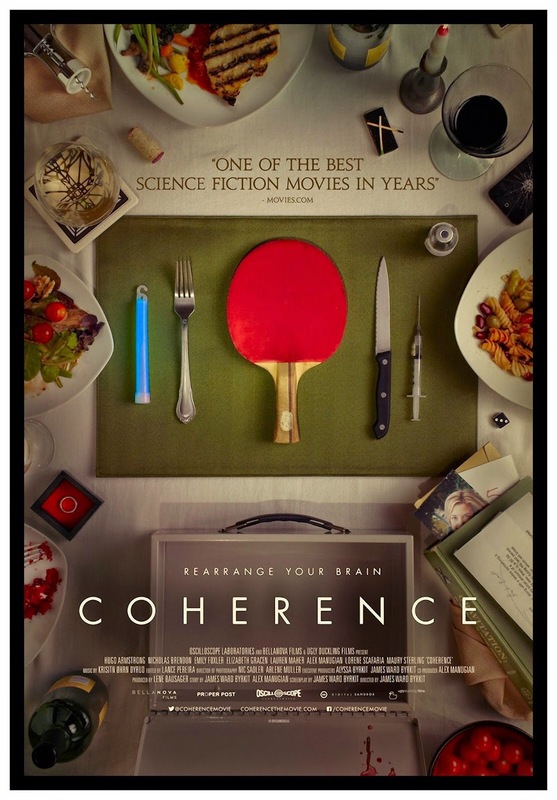 It became the dinner party thriller that people were talking about yet James Ward Byrkit’s Coherence (which was first released two years earlier) went largely unnoticed. It did gather some positive word-of-mouth around the festival circuit but this film was more dynamic and much more deserving of a wider audience. Plot: A group of friends meet for an evening of chow and chat on the night that a passing comet flies close to the earth’s atmosphere. It’s an event that hasn’t happened for decades but also has the possibilities of some strange events occurring. The friends soon discover that they might be living in an alternate reality as fear and paranoia creep into their increasingly fraught and tension filled dinner party. Shot on an impressive shoestring budget of $50,000 in one location and with an entirely unknown cast that improvised most of their lines. With this in mind, Coherence has a very strong chance of being an absolute disaster and a word of warning to all budding filmmakers in what not to do. However, it’s quite the opposite. Byrkit shows what the possibilities are when the writing is strong and you have a confidence in your approach. He has a fine and steady hand with his direction and delivers a taught, intelligent and hugely involving mystery in his feature debut. Coherence really has no right in being as good as it is but it absolutely works. It’s strengths lie in treating the audience with respect and you’re left in a position where you have to return the favour. It earns your admiration as it demands your attention to keep up with the twisted and, sometimes confusing, plot developments. That said, Byrkit doesn’t want to leave any of his audience behind, so he does take the time to explain his scientific and philosophical theories but he never loses sight of his brisk pace and he doesn’t forget that the film is essentially a complex puzzle – and a very good one at that. There are some minor plot discrepancies here and there but these do not overshadow the sheer brilliance and execution of its genuis science fiction concept. A remarkably assured debut from a promising new directorial talent. Trivia: Instead of the actors receiving scripts, they would each receive only a small paragraph (that only they would see) as their goal for the day. This allowed for the story to unfold naturally and create genuine reactions in the other actors. This entry was posted on January 17, 2017 at 9:38 am and is filed under Mystery, Science Fiction with tags 2013. You can follow any responses to this entry through the RSS 2.0 feed. You can leave a response, or trackback from your own site. Great little flick, Zoe. I actually seen it ages ago but I rewatched it recently and it still held up. One of my favorite movies, Muckers! Nice to hear you liked it too! A favourite you say, sir? I can see why. It’s a solid little film with a fabulous premise that plays out brilliantly. Impressively shot on a shoestring as well. Loved it mucker! Boat Drinks! I’ll confess, i was completely confused by the film so much that i stopped enjoying it. Also i didn’t like any of the characters. There were a couple of moments where I really had to concentrate but, for the most part, the director managed this extremely well. I thought it flowed brilliantly. Totally new to me but I’m very intrigued. Love the poster! It’s well worth a look, bro. I was very impressed by how it managed itself on such a shoestring budget. It’s just another example of how you can’t go wrong when you have a strong concept. A gripping little thriller that has an intelligence to it. Been wanting to watch this forever man! Glad it curried favor with you, and I think I’ll get along with it just fine. That’s really great trivia at the bottom, too. That must be so refreshing for actors to have to create in that way, rather than the typical line-learning and reading yada-yada. Of course as you suggest, some of these actors may not have been in the biz very long so everything is pretty ‘fresh’ but no doubt that sounds like an interesting way to work. Like i’m sure it always is with people like Terrence Malick. Keep this one on your list, man. It’s a tight little film. It is refreshing to see the approach it takes and the fact that the cast is largely unknown really adds to its believability. One of the best little indie’s I’ve seen in some time. The whole one location thing definitely sounds like something that would appeal to me. By having just a singular location, a film for me often feels very taut. This is that type of film, man. Very tight and gripping. With an intelligent script as well. My kind of movie then. How are you Mark? Been meaning to ask. I’m good, man. Not had much time to blog but trying to creep back in again. Take it slow buddy, we will all still be here for you. Appreciated me old chum. I’ve really not been up to a scratch for a good while. Good to know you still have my back, though. Ive always got your back dude. You were one of the first people to support me and I’ve never forgotten that. I’ve been reviewing quite an array of things at the minute. I was one of the first was I? Good to hear mate. Yes, you were one of the first people to follow me. Good little movie this isn’t it? It just goes to show, like Primer, that you don’t need a big budget to make a fascinating sci-fi movie. It’s a great little flick, man. I had seen it a while ago but after a rewatch, it still stood up so I added a few brief thoughts on it. Absolutely no need for a big budget when you’ve a genius concept!